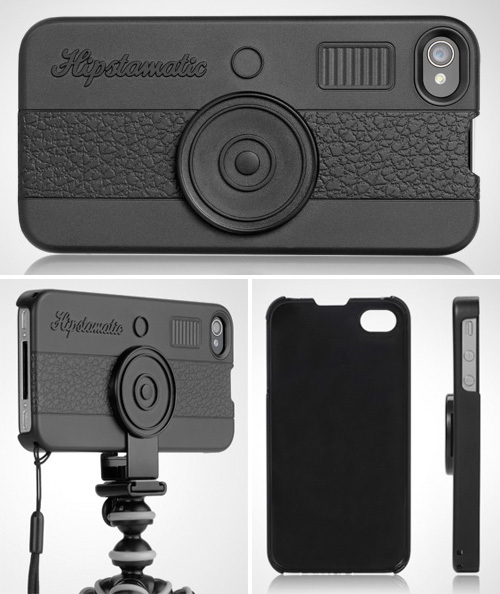 HipstaCase Makes Your iPhone Retro Too | OhGizmo! Your Flickr feed might be chock full of retro-looking snapshots, but I’m afraid you just don’t look the part when you’re out there taking photos with your high-tech looking iPhone 4. So the makers of the Hipstamatic iPhone app have created an official HipstaCase that makes your iPhone look a little more like a retro film camera. But it’s not just about looks. The case is semi-functional too since it features a hidden slot on the front allowing you to attach an included tripod adapter. There’s even a set of holes on either side of the bottom allowing you to use an included lanyard and keep your phone dangling from your wrist, ready to snap a hipstery photo at a moment’s notice. Available May 5 for $39.95.